streams and negative profit margins as well. erosion. It makes no sense what so ever to bale up corn stalks. Baling corn stalks not only wastes time and money, it robs the soil of needed carbon. make a $4 bale of corn stalks. It just doesn’t make sense to mow, rake, bale and transport an almost worthless feed. the most valuable asset on the farm – the soil. first step in the erosion process. Much of the land is bare after corn stalks are removed from the field leaving the soil exposed to the impact of raindrops. of its ear and leaves the stalk on the ground. protect the soil during the winter. lamentable and a sign of poor farming. Excellent article Bobby! A much better choice for cattle producers with thin hay supplies is to plant annuals for forages such as sorghum-sudangrass. It is a rapid growing warm season hybrid grass that doesn’t cost much to plant, is easier on the hay equipment and is much more nutritious. It can be baled a little on the moist side to allow it to ferment some and limit the possibility of prussic acid poisoning. It also makes a thick residue cover if cut high and will hold the soil and moisture. One negative thing about the new GMO corn varieties is that they have very tough stems and most cattle find them unpalatable compared to non-GMO corn. I met with one producer recently that plants non-GMO corn for his deer plots but GMO corn for his crop. If one must plant corn for cattle to save on purchased hay, a much better variety is the Goliath Silo corn that yields up to 50 tons per acre of silage. Plant rye between the rows after the second cultivation and limit any erosion after harvest. I planted some on 15 inch rows a couple years ago in drought conditions and let the cattle eat it in the field just like pasture long before it matured. I had excellent residue cover and fertilizer spread for me. Even better would be for cattle producers to give up feeding any corn or corn stalks altogether and get the cattle out on intensively rotated pastures where they belong. We feed no corn as grain at all to our cattle in 6 years now. I will put up our steaks and roasts against any corn fed beef and win most taste and tenderness tests. It takes a few months longer to finish but almost half the feed cost of feeding grain. I’ve heard a lot of talk recently about cellulosic ethanol for fuel which would involve converting inedible feedstocks such as cornstalks into ethanol or biodiesel, using micro-organisms. As this technology has a potential to develop in the future I predict the price for cornstalks may go up, and it may become economical to bale and sell them to make biofuel, which sounds to be a better use than livestock feed. After reading this article, I hope that the chemists looking into the biochemical process are considering the environmental impact of consuming the cornstalks for biofuels. I don’t think the benefits of energy security, and the alternative to gasoline are worth the potential damage to the soil. However those are very big national priorities since the Energy Security Act of 2007. The soil and water conservationists may need to look into ways that a sustainable process could be developed to use the cornstalk remains for biofuel energy. If not, I fear no one else will. Then we’d be in really bad shape if there is no plan for nutrients or erosion control and the ‘clean energy jobs’ created by government start swiping all the cornstalks. Alex, good comment. The bottom line though is you can’t get something for nothing. There must be cover on the land during the winter. We cannot keep taking and taking and taking from the land without putting something back. How long can you keep drawing on the principal? We need plant breeders working on winter cover crops that can grow in colder temperatures. We need perennial grain crops. We need cover on the soil and we need to use the soil as a carbon sink. This post reinforced what we had been discussing in class over the past few weeks, in that the worst thing we can do to mismanage the soil is to leave it bare with no cover crop. However, how are we going to be able to reach out to farmers and educate them on the damaging effects of balling corn stalks. What kind of incentives would be needed? What is done with the corn stalks at the beginning of the next growing season, when a new corn crop needs to be planted. Why not plant a cover crop among the corn before it is harvested while it is still warm enough to plant whatever cover crop is used? I know when we leave corn in our fields the stalks take a long time to break down. Does having those hard corn stalks cause problems with seeding the next crop? I know you had mentioned in class that the stalks would break down before the next growing season. I was wondering how long that would take? and If they breakdown to soon will there be anything to cover the ground from snow melts or early spring rains? You had mentioned in class that the stalks would break down rather quickly. I was wondering how quickly they would break down? If they break down before something else can be planted there would be nothing to protect the soils from snow melt or early spring rains. What is done to inform farmers about the lack of benefits and high cost it takes to bale corn? In class, we talk about the first step towards implementing new environmental practices is education. Maybe it’s because I neither grew up on a form or study environmental science, but I had no idea before taking this class about the dangers of leaving a field bare or the benefits of leaving crops in. Is there an effective way to pass this information on to large groups of farmers? I wonder how long it will take for people to realize that leaving organic matter on the ground to degrade and bring nutrients back to the soil is very logical? Also,do you know of any studies that assess, in terms of economics, the value of leaving corn stalks on the ground soil? Modern GMO corn varieties can take a long time for the residue to break down completely and can puncture tires on tractors and other implements. I have seen corn residue present 2 years after the corn crop was harvested in no-till situations. With the highest cattle prices on record and limited hay supplies from high commodity prices and drought, baling corn stalks is becoming very popular with cattle producers to carry them through the lean times. Nutrition available is not sufficient to allow cattle to gain 2 to 3 pounds per day but most farmers I work with only use the corn stalks as a filler and after a rotation of several years of alfalfa or mixed alfalfa and grasses. Corn stalks are often mixed with other feed and/or vitamins and minerals. Baled corn stalks in Michigan are about $80 ton out of the field. Sorry that this comment is delayed but I found your post to be very interesting. I remember talking about this during class and thinking to myself, “how could anyone go out of their way to hurt their crop field and economically hurt themselves?” It just doesn’t make any sense to me. It seems hard to believe that they would not realize this as a major mistake that they are making on their fields. When baling constalks, you do not dig up the entire plant and then bale it up, leaving the field bare. The corn is harvested by a combine, which spits out stalks, cobs, and leaves that are chopped up (residue). There is usually about 6″ of corn plant left standing after combining. If a farmer decides to bale the residue, they usually rake it into windrows and then bale it, leaving the part that is still standing in the ground. Sometimes, a mower is used to chop the residue (and some of the standing stalk), but there is always some stalk and the entire root system still in the ground. Most people around us leave this standing stalk and root system undisturbed until spring planting. 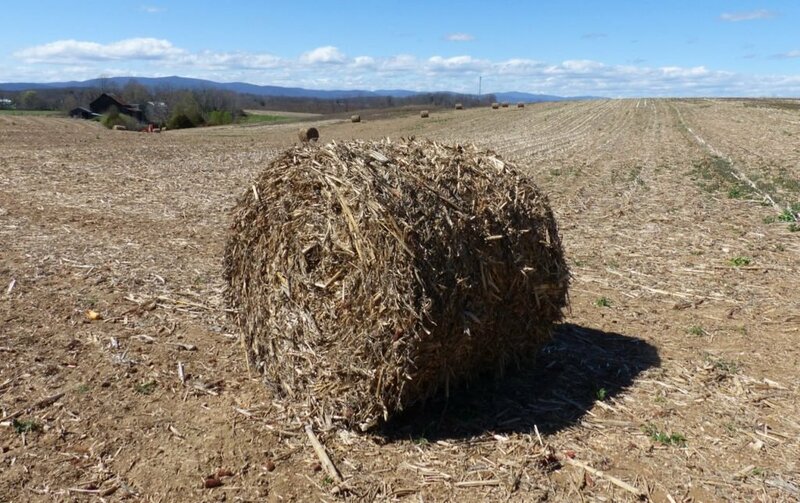 Baled corn stalks can contain 5%-30% crude protein (grass hay can contain 10%-30%)and can be fed to cattle along with other feed. Much of the nutrients and organic matter lost by removing the residue are returned to the soil when composted manure is spread on the fields in the fall. I will agree that baling up corn stalks will leave a 6” vertical stub and the roots. This leaves 90% bare ground all winter long which leaves your soil vulnerable to the impacts of falling rain. I have never seen a corn field harvested for grain and the stalks removed (with no cover), without visible signs of soil erosion the following spring and I have been evaluating fields for erosion for over 30 years. Even flat fields are vulnerable to the forces of erosion but any field with a slope (greater than say 3%) like we have here in the Valley will suffer greatly from erosion in fields left in these conditions. Visible signs of soil erosion such as small rills and gullies – translates to at least 15 tons of soil per acre moving down slope. The worst thing about this is the top ton of soil is the most valuable. (One ton of soil is about the thickness of a sheet of paper over one acre.) How much is the most productive ton of soil on the farm worth? Your figures on the amount of protein in a corn stalk after grain harvest surprise me. I have seen no data that even remotely suggests that the corn stalk would have as much protein as alfalfa hay. Corn silage doesn’t come close either. Even fescue hay has more protein than a corn stalk. I will stand firm on my post that corn stalks are far more valuable left in the field to protect the soil from the forces of erosion during the winter and to enrich the soil with organic matter. It is a wasteful practice and in my opinion a sign of poor management. I did a simple Google search to find the numbers. Some of the numbers seemed high to me also, but it seems that the values change quite a bit from one year to the next and from one area of the country to the other. From the 2011 Feed Composition Tables found at beefmagazine.com: (all Crude Protein percentages) alfalfa hay early bloom 19%, alfalfa silage 18%, corn stalks 5%, corn silage 8%, fescue hay 11%, grass hay 10%. The higher CP content is good for lactating dairy cattle on a mixed and metered ration, but mature beef cows do not need that much protein fed free-choice. Cornstalk bales also contain leaves, cobs, and some corn that is missed by the combining process. I am not sure if the CP percentage includes this missed grain. That amount would be hard to figure out since it would vary according to the brand of combine and how the operator has set up the equipment. I agree that they should not be used as the only feed source, but are useful as a supplement to “water down” the high-protein hay. An animal that has been grass fed on pasture all summer cannot handle switching to high-protein alfalfa hay in the fall without serious health problems. Another reason for baling cornstalks is to use for bedding. Not everyone grows wheat, barley, or oats and has straw available for bedding. Straw can be expensive, depending on the area you live in. The corn stalks and leaves last longer in a bedding pack than straw, absorb more moisture than straw, and are usually still pretty much intact when we spread manure in the fall, even after it has composted over the summer. After baling the residue, we spread manure from the barns that contains large amounts of straw and cornstalks that we use for bedding during the year – the ground is not bare. Basically, we are putting back about the same amount of residue we have taken off by baling, plus the manure. The bales from the fall are used as bedding fall, winter, spring, and summer, and then spread back onto the same field. In the no till (fairly flat) situation we have, our fields have no noticeable erosion, while our neighbors, who do not bale residue, but plow the stalks under in the fall, have gullies on their slopes and along the waterways. Just like you are unsure about the protein numbers, I am unsure about the your quoted cost of making the bales. That must be with a new equipment cost worked in. This is equipment that most farmers already have to bale hay. We had our stalks baled by a custom operator last fall because we had some equipment problems. We were charged about $13.40 per ton (our bales averaged around 1200# and we were charged $8 per bale). Right now, baled cornstalks are selling from $60-$70 per ton in our area, depending on the quality of the bale (moisture content when baled). In our case, it cost us under $14 to make a $60 bale. I am wondering how you would suggest we handle the residue in a no till situation. If it is isn’t removed (baled), chopped into tiny pieces with a stalk chopper, or plowed under, the residue causes many problems by plugging up the planter in the spring. I resent being called poor and wasteful farmers. We have worked with our local Extension Office (visits every 6 months)for over 20 years on developing better farming practices than Great-Grandpa had – including fencing our cattle so they can not walk in our creeks, improving our manure composting site to prevent run off, developing a rotational no till crop plan, planting grass cover in field waterways to prevent erosion, and remodeling old buildings to be more efficient. Sorry Rachel, I did’t mean to offend you. It sounds like you are doing all the right things. Thanks for taking the time to explain your situation. And thanks for fencing your livestock out of the streams. No-till is a great conservation practice. Coupling this practice with high residue cover crops and perennials in a rotation goes even further. I am glad that your ground is not bare during the winter. I am worried about that manure on top of the ground though. I am still a believer in leaving the stalks and there are some really good pieces of equipment that can slice right through that residue. Here is a link to a great video on no-till that the Downstream Folks put together. You might want to share this with your neighbors. No-tilling into bare ground is not really no-till, there has to be residue there to get the full advantage of it the practice. What’s the soil organic matter content of your soil? Is it above 3%? A good goal would be to have this increasing until you get to 4%. Maybe you are already there! Thanks for being patient and for being a good conservation farmer. Glad your grass hay is 10%…..mine is usually around 6%……I JUST CUT AND BALED 525 ROUND CORN STALK BALES and put 125 away for myself to feed with range cubes. The remaining hay has been sold out at $30 and local farmers are asking for more. As for the cornfield, with 32 years farming, i’m not at all concerned about any erosion or related matters. In fact, I’m overseeding oats, wheat & clover & purple turnips for a late november hay cut !!! Well good morning Arkansas Farmer. Thanks for taking the time to post a comment. I’m not sure you got my point. You didn’t mention manure. Do you put any manure on that corn field? Anyhow, it sounds like you are taking all your carbon off the land. What’s the organic matter content of your soil? What gets me is, what are you going to do with the baled up corn stalks? Who would think that baling them is productive?. I then have to question how they don’t realize that they’re spending more money to bale them then to just leave them on their fields to provide nutrients to the soil. I bet it was an aesthetics thing, the Hillside Project at JMU is a great example of unnecessary upkeep that costs more money and more fossil fuels to mow, when it should only be managed for invasive species. I hope somebody tells that farmer in a nice gentle way that he’s only hurting his own wallet and not making much of a difference with aesthetics. I really don’t understand why the farmers don’t just leave the bare corn stalks on the fields after the corn is harvested? If baling the corn results in losing money (it costs more to make than to sell) why would any farmer do that? How does that benefit them in any way? Maybe one of the problems is that some farmers do not understand the value of having decaying organic material protect their soils. I think the first step in solving this problem is educating farmers on an individual basis about the benefits of protecting their soils with the bare corn stalks. It is interesting that all farmers have not grasped the concept of crop cover and the vital importance organic material breakdown has for their soil productivity. Why do farmers bale this hay if it is so economically challenging? Are they not checking their numbers? Is this something that can easily be missed? It has been apparent to me that farmers strive to be effective, especially with their money. Is there any benefit to this process? So Bobby, I bet you don’t make your living farming, do you. It sure seems easy giving recommendations like you just did. I would be careful making blanket statements about not removing stalks. We have some fields that the stalks are impossible to plant through in the spring without sacrificing stand. 250+ bu corn leaves a lot of trash. I do believe that most farmers should leave them in the field but those of us who are nearly 100% no till with very high yields are at a point that the stalks are a problem in continuous corn. We have found that wintering beef cattle on those stalks whose hooves work them in the ground help a lot but cause too much compaction fr no till if the ground does not freeze. Cover crops help a lot but sometimes they do not grow as we like. In summary, be careful Bobby. A lot of people on here do not know farming and will take your words as accurate and will go around condemning us who are trying to make a living growing food for you to eat. Hank, thanks so much for taking the time to post a comment here. Indeed we do farm. We have 120 brood cows for a cow/calf operation. It’s not our only source of income but we do go through the joys, pains, sorrows and love for farming. Thank you for being polite in your comments and please know they are well taken. I still stand by my remarks. I’m a die hard soil man and have yet to see a corn field, harvested for grain, and the corn stalks removed without soil erosion. I am a soil man as well. I had corn avg 335 in one field with a lot over 275 this year. My county average is 110. I had 1 field average 285 with only 105 units purchased N. I agree the key is organic matter in the soil. However, have you ever tried to plant through 5 inches of left over stover in the field? I am committed to as much no till as possible but excess stover on the surface is creating a problem for me and a lot of other farmers as well. I have tried spraying N in the fall, quick lime, … Trying to make it disappear before spring. My best solution so far is using my cattle to work in the stover in the soil. Cattle eat a lot of it and pass through the organic matter via their manure back to the soil. In addition, they work a lot of it back into the soil where it can be broken down by microorganisms. I haul hay to the corn stubble fields for this purpose. Anyway, my main concern is your blanket statement about removing stalks. Farmers have enough of a problem dealing with uninformed public and we do not need any of them (meaning our gov.) on my back telling me how to farm when they don’t have a clue. Look at the entries above…looks like you already have some couch sitting want to be farmers already judging me. I have nothing against these people, but they have already formed an opinion based only on your opinion. That, my friend, is dangerous in a society like ours where our gov is far too reaching and is destroying our economy by constantly passing legislation that makes it harder and harder for businessmen like me to have any success. Hank, it sounds like you are doing a terrific job and I think we are agreeing. What I was saying in the original post was that harvesting corn for grain and then bailing up the stalks – all of them – meaning the soil is bare all winter long – is not good agronomy or economy. It sounds like you don’t leave any of your soil bare all winter long. Your yields indicate you have organic matter well over 3%. Keep up the good work. Stupid, but sincere article. Next time you want to open your mouth and pick up your pen to write something, think of all the starving cattle and horses in michigan and the families that are struggling to put food on the table, let alone pay $190.00 for a round bale of dusty hay to feed their milk cow. When drought hits, all bets are off on the “poor condition of the soil” because of baling corn stalks! Thank you so much for your tactfully written prose. To be fair, you have a point about being in a drought…all bets are off. I agree. However, a healthier soil will produce more forage than one that has been degraded by constantly removing the carbon, i.e. corn stalks. Corn stalks are better than a snowball, but not much. Remember, it costs more to make the bale of corn stalks than the nutritional value in in the bale. So why not spend the money you would waste on making the bales to purchase more and better feed? I don’t think you got my point. I really have to question your financial numbers. I do not know of anyone who would sell corn stalks for that cheap, but if you could give me some names, that would be a very cheap source of fibre/filler for the animals and a very cheap source of bedding. I would value corn stalks at a much higher rate for my own use simply as a fibre/filler or bedding. I have found that the variable costs for baling corn stalks is far lower than $50/tonne and the fixed costs are debatable. By making such an absurd financial assessment of baling corn stalks I also have to question your agronomic knowledge. First of all I want to say I DO have a Bachelor Degree in Agronomy. I also row crop farm and own 60 head of stock cows and background my calves. The name of the game is make money without shooting yourself in the foot. I have my own equipment and it costs me around $6.50/bale (1200#) to roll up corn stalks, like wise if you calculate fertilizer and other inputs my BE on a bale of 12% CP hay is around $35/ton. These are 1400# bales. So, in my operation we sell are hay for $150/ton (2013 crop) and feed corn stalks, corn silage, and dried distillers grains to our cows. Doing this GREATLY decreases my costs!! It is around $2.75-$3.25 per head per day less. I shred my stalks, rake, and then bale them. I do not see any differences in my fields that I bale compared to ones I just disk the stalks under, yields all run similiar. Not sure if your making these same comments on fall tillage as well or just the baling of stalk residue. In fairness I do apply an additional 500 gallon of hog manure to the fields I bale up. I usually run 5,000 gallon/acre on everything else. As far as your erosion statement and your comment on being poor managers “keepers” of the land, my farm is a century farm. I assure you that out in “the real world” I am not doing anything that is putting my land in jeopardy that my son and his son/daughter won’t have an opporuntity to farm the same farm in the future. For information purposes the farm runs 4-5% organic matter and has a 10 year average of 176 bu/ac. Please dont make statements that are mis informed and hurt what my family and I do everyday for a living so that MANY may eat the BEST, CHEAPEST food in the world. Just read this and had to respond. Our family farm grows corn. We also leave 5″+ on the ground after baling cornstalks and is great for trapping snow that blows through, adding moisture to the soil. We sell bales at just under $100/ton. Either your marketing skills are bad or you don’t know how to network. People out west use more cornstalks than I can supply. This article needed quite a bit more research. Wes, thanks for taking the time to post a comment. So, you leave a stump to collect the snow. How’s your organic matter? If your SOM is above 3.5% my hats off to you. Good job. Here in the East our soils are in desperate need of organic matter…it’s the glue that holds it together. When we take our stalks off we lose the opportunity to but that carbon in the ground where it’s needed. Maybe you don’t need any organic matter. All the best to you. I find this article to be very misleading. The corn stalks are almost never baled for feed. There primary use is for bedding and they do a very very good job of absorbing moisture. The stats about their limited feed value are totally worthless. Farmers are not misinformed of the effects of taking cornstalk off of a field. That’s why they set the rakes to only collect about 2/3 of the residue. This way they leave enough cover to prevent erosion and to decompose back into the soil. Thanks for stopping by and for your comment Michael. Can you tell me the percent of organic matter in your cornfield soils? Is it below 3%? We use corn a talk bales for bedding after we take off our snaplage in fall. We have plenty of time to plant rye or winter wheat if we plant a short day variety here in Wisconsin. I think maybe you article over generalized a tad. Farmers never have the first thought of ruining the land that we depend on year after year to feed our animals. Becky, thanks for stopping in and commenting. Sounds like you are doing a wonderful job. Thanks for planting that cover crop and the short season corn. That’s exactly what needs to be done. I see too many fields bare in the winter. Also, I stand on my facts about the value in corn stalks. The carbon is worth more in the soil, as it lays, than the energy it takes to bale that carbon up, transport it, store it, put it out, gather it up and redistribute it….That takes a lot of energy. It might be cheaper for you to buy carbon from another source. You touched some nerves with your comments. As an Extension Agent, I spent 31 years advising farmers against using crop residues as hay, but promoting corn silage at the same time. Our loamy soils are difficult to protect from erosion and even more difficult to build organic matter. Corn stalks are an excellent mulch that breaks down slowly. The best high-yielding corn was grown in fields where corn stalks were visible from two years back. The leaves were gone and so were the husks. Since the corn stalks make up 50% of the crop residue and the TDN value shows it worthless as a feed stock, the problem is that the residue should be sorted and the other digestible residues removed as fair quality hay or silage. Feed quality is more than protein. Protein is cheap to supplement but energy is not. Corn husks and leaves are better feed than most cool-season hay bales in terms of digestible energy. My steers are grazing the corn stalks where newly planted wheat is emerging. They are heavily supplemented with minerals and protein. The calves will walk away from good orchardgrass hay to munch on corn husks! Hay costs are too high and we must find alternative roughes that are cheaper to feed than hay. Sorting the residue gives us soil protection and rainfall infiltration while offering cattle a better grade of forage. There seems to be a lot of misinformation given in this article. I would suggest you peruse through the University of Nebraska at Lincoln’s studies on this matter to get long term data collected in regards to feed value, cost of cornstalk bales, etc. Each farmer is not the same intellectually, so I will speak of my practices. First off, when bailing corn stalks, you take half & leave half. This allows the bales to be fully utilized by the bovine, and ensures what you take off is the highest of nutritional value. 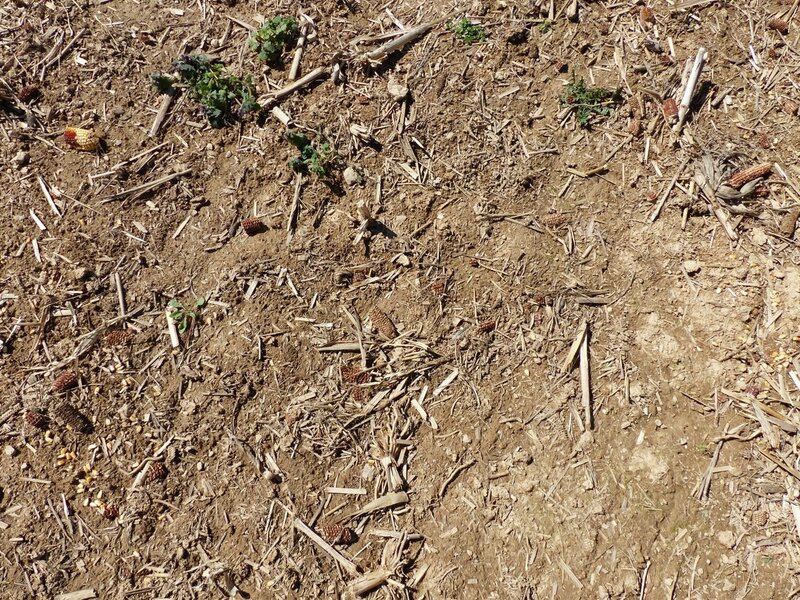 This also makes it easier for the no-till operations the following spring by reducing what they call “trash” that can be a hindrance to planting. Another rule I follow, is to only bale corn stalks on fields that are fairly flat with minimal erosion problems. I agree that we need to take care of our land, but as a few have mentioned before on here, you are blowing this way out of proportion & doing a great disservice to your followers by giving them a one-sided view that is very far from the normal practices of this matter. In my 36 years, I have never seen a baled cornstalk field look even close to the picture you have accompanying your writings. I am not saying that it doesn’t happen, but it is very far from normal & you are persuading your followers to think that this is happening on a large scale of farms across our great nation. I hope for you and your followers that you educate yourselves more on this matter. I also forgot to mention that you always put back the nutrients that you took off by baling & rotate which fields you bale. Also, in my case, cornstalk bales are actually worth a lot more as feed compared to the costs to produce them. They are used as a cheap filler feed in the mix, so they are not wasting the costly very high nutritious feeds that they are also consuming. John, thank you for posting your comments. Thank goodness you leave at least half the stalk and only bale on fields with little slope. Good form, sir. Under those conditions, I will agree with you…(maybe). The pictures I uploaded are from a field only 6 miles from our farm and it’s pretty typical of those farms, here in the Valley of Virginia, that bale residue. There are not a lot of them because most farmers, around here, like you, understand the value of leaving residue. As a matter of fact, I think 75 to 80 percent of our corn farmers plant cover crops and some leave the stalks and plant cover crops. Good luck this coming growing season. May you have a prosperous year. In the 70’s they had animal bedding called StaDry. It was shredded corn stalks in a very compressed bale abot 2’x2’x15″ wonder why they stopped making it.